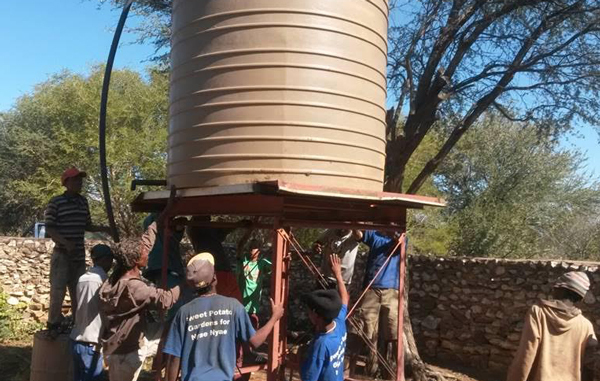 Villagers in the Nyae Nyae Conservancy installed a water tank at !om!oo as an ongoing process of investment in human capital, resources as well as education in their communities. The villagers in these areas have developed easier access to water in the Conservancy, since water availability is often a constant struggle. The Nyae Nyae Conservancy is responsible for approximately half the village and game water points in the area, which means over 20 water points spread throughout the nearly 9,000km² of the area and of late it is bearing real fruit as access to water is changing lives in a very tangible way. Accessing water in communities where there is almost none requires long term planning and solutions. The first priority is to ensure that boreholes are functioning and in turn solar submersible pumps were introduced. According to the Nyae Nyae Development Foundation an additional challenges in the Conservancy are the more than 1000 elephants in the area. “Thirsty elephants looking for water would destroy the water points in the past. The water points had to be protected from the elephants. This in turn meant also creating game water points so that the elephants still had access to water, but were kept away from the human water points as well as the villages. A real challenge for all those involved,” they added. The Foundation said, with access to water becoming more freely available at Nyae Nyae, agricultural projects involving gardens and livestock started to take off. “This immediately put pressure on the availability of the water in the Conservancy, especially storage of water became a limiting factor. To remedy this issue, all villages have been given 5,000 or 10,000 liter tanks depending on the village size and agricultural activities in the past few years,” the foundation said. Some of the villagers, like #oma naici when asked about the impact of the water developments said:“ now he can make full use of their 6600 m2 garden because there is enough water.”Glao lamacea added that, “ livestock and people can go days longer if the pump breaks and maintenance is in progress, since the tanks can store enough water for them to keep on with their activities.”, while Koba temi said that the water security is an opportunity for people to be clean and healthy. These water development projects, activities and remedies in these areas have been funded, encouraged and supported by a number of donors over many years including the MCA, EIF, Redbush, Hui-a-khoe and recently the EU Climate Change Adaptation Project.